Today I bring to you 7 ways by which you can use ajwain for cold and cough in babies. Ajwain, ajowan, omam or carrom seeds play an important role in curing various ailments. It has been used for indigestion, loose motions, vomiting etc. Apart from that, it is also used in home remedies for cold, cough and chest congestion in babies and adults alike. Ajwain or carom seeds are among one of the popular Indian spices. As a kid, I used to love ajwain paratha and ajwain ki puri. I got to know about the health benefits they offer, only after my first delivery. My mother used to prepare a mix of roasted ajwain, saunf/fennel seeds and til/sesame seeds. This mixture was supposed to be eaten after every meal. Trust me I did not suffer from any digestive problem even after the C-section delivery. The mix also helps in lactation. Also Read: 15 Superfoods that increase lactation. Ajwain seeds contain minerals, vitamins, antioxidants and fiber. The thymol, present in ajwain gives it the antimicrobial properties and thus helps to relieve congestion. Ajwain seeds are sort of olive green to brownish almost khaki in color and have oval or elliptical shape. They are very flavorful and these tiny spice seeds have enormous health paybacks too. Ajwain seeds are very beneficial for digestive and respiratory problems. Here are the 7 home remedies for cough and cold using carom seeds which are very safe for babies, toddlers, kids and let me say everybody. I use these remedies as a preventive as well as corrective measure for my kids. Ajwain kada or herbal concoction with ajwain can be given to babies of 6 months and above. It is a very simple and effective recipe to combat cough and cold. This decoction also cures digestive problems. Mix all the ingredients in a heavy bottomed pan and boil for 10 minutes. Strain the liquid, let it cool and then give it to your little one. For toddlers above 1 year, 2 tablespoons of honey can also be added to the decoction (once it is cold) and given. For 6 months to 1 year: 1 teaspoon – 2 times, after food, morning and night for 3 days. For kids above 1 year: 1.5 teaspoon – 2 times, after food, morning and night for 3 days. Please avoid giving it along with cough syrups and medicines. In case the problem persists or aggravates, do get the medical assistance. Roast 2 tablespoons of ajwain on a tawa or heavy bottom pan for a few minutes until the smell emanates. You can also refer to the home remedies for chest congestion in babies and kids. Dry roast 2 big garlic cloves and 1 tablespoon ajwain seeds on a tawa. Once cooled, make a potli out of it. Place this potli in the baby cot or cradle where baby sleeps. The garlicky ajwain smoke from the potli would help to unblock the nose and relieve from congestion providing relief for the baby. NOTE: Kindly DO NOT keep the potli near baby to avoid chances of choking or breathing hazard in anyway. If you are looking for a tasty medicine that will tackle cough and phlegm, then this is what you have been looking for! You can prepare the powder by mixing equal quantities of dry roasted ajwain that has been powdered with jaggery. You can give it to kids above one. Dosage: Kids between ages of 1-3 can be given half a teaspoon with ghee before meals, twice a day for 3 days. Kids above 4 can be given a teaspoon full of this powder with ghee before meals, twice a day for 3 days. Note: Prepare small batches as spices tend to lose their flavour and aroma over time. Boil a big cup of water with half a teaspoon of ajwain. Let it cool. Offer sips of this to kids above six months of age. Dosage: You can give 2-3 teaspoons of ajwain water per day for kids below 1 year, for 3 days. For kids above 1 you can give up to 1/4 cup -1/2 cup depending upon their age. You can do this for 3 days. Note: Kids below 6 months do not require anything other than breast milk to keep them hydrated. Massaging your little one with ajwain infused oil is a great way to combat the cough and cold. It can be used as a preventive measure as well. To make the oil, add 1 pinch of ajwain to 1 tablespoon of massage oil and heat the oil for a few seconds. Let the oil come to a bearable warm temperature. Use this oil for massage. Apply this oil on the chest and back while massaging the baby gently. One can also add 1 to 2 cloves of garlic for additional health benefits. While making your child’s favourite soup add a small pinch of ajwain powder to it to spice it up. Don’t forget to read the 21 home remedies for cold and cough in babies and kids. 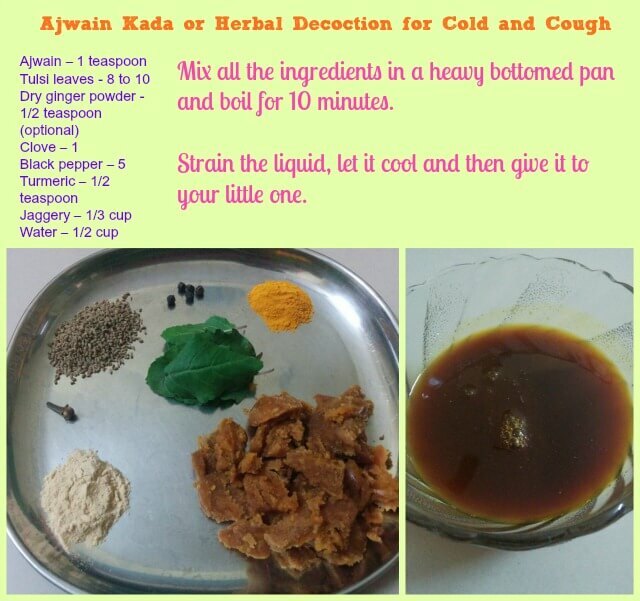 Hope this post on ajwain for cold and cough in babies and kids was helpful. Please do share in comments the tried and tested home remedies for your little one’s cold and cough. If you know of any ways you can use ajwain for cold and cough in babies, do share with us. It may be useful for other moms. Kindly help to spread a word on this informative article, by sharing on Facebook and Twitter. Remember sharing is caring. Next Article How to Get Rid of White Spots on the Face of Babies and Kids? Hi my son is 6 and a half months old, suffering from heavy cough… I wanted to give the ajwain kada… so my doubt is can we store the decotion in room temperature for 3 to 4 days…. I was told to give almost the same decoction to my little one daily ( 1 – 2 oz. ) but with an additional tiny piece of darcheeni and 2-3 seeds of Bari elaichi as well to prevent him from getting a colds etc during winter …. He is almost 6 months old now …. I felt that it was a little too much for such a little baby as it has too many warm ( inducing ) spices/ingredients …. And now I’ve noticed him sweating which he never used to …. And it’s -10 outside ? N he’s not dressed too warm aswell …. And his poop’s color has changed a lot too since I started giving it to him …. could it be that it is inducing too much heat in his body and that’s causing him discomfort and sweating and change in poop’s color …. Hi neha..thank you for the kada recipe..My 8th month old daughter is suffering from severe cold n cough..i hv bn gvng the kada for the last 2 days..can i gv it for more than 3 days of the cold persists? Yes , If you feel that your daughter is responding well to the Kada , please continue for a 2-3 days. Do give steam inhalation as well. Hi….neha my daughter have one year n she have cold cough last week I try my best give her medicine but not well my baby n she not take interested any kind food plz help me what can I do m worried about my daughter kindly suggest me….. ? Hi…my baby is 9 Mon old n his weight is 12kg.he is having prob of dry cough cold during 1n half Mon m giveing him medicine as per doc but till nw prob is nt solve.what should I do? Please continue with steam inhalation and medicines as suggested by Doctor. You can also try using a humidifier and give ajwain hot pad / potlis . Keep baby well hydrated with breasmilk and warm foods. He will be fine. Cold and coughs are part of growing so dont worry. Hi.. Can I give that herbal decoction to my 6 month old baby? Is it effective for running nose and sneezing? Do I need to prepare every time or I can store it? For younger babies (less than 6 months) , I would suggest Steam Inhalation , Ajwain smoke & potli and Massage with ajwain infused oil . These are the best remedies for running nose. If you have started solids for you baby , you can give as per the dosage mentioned in the post. You can store it for 2 days at room temperature (though would recommend preparing fresh for younger babies). Can the desi cough syrup you suggested be left outside at room temperature? If yes, for how long will it be good for? Yes, the syrup can be left outside at room temperature for 2 days. I make it in small quantities & make it again as needed . you are just awesome. I feel so grateful to have such people like you. so thankful to you for sharing your experiences and home remedies with the world. your remedies are boon to every mother. thank u for being there and caring for us and our little loves. God bless you. – a mother of 2.3 years old son. Thanks for a very very encouraging feedback. It means a lot to me. It’s just wow to read this blog and hats off for ur tip. Surely will try this tip on my little one. Thanks for stopping by and giving a feedback. Do try this desi nuskha & let us know your response. Thanks for reverting with the feedback. Thanks a lot for the kind words Sayandeepa. Such words are motivating for the team . Thank you so much for sharing such superb information. I m so happy to have found your site that answers most of my queries and shares such valuable information! I’m Jatin a 21 years old. I’m suffering from chronic sinus blockage, any home treatment that you can advise me to get cured. I have used ajwain potli for seekai for my forehead and cheeks and it was really helpful. So any more seekai treatment that you can suggest. I would suggest to go for breathing exercises (such as Anulom Vilom & bhastrika) for getting rid of the problem. You can also try the Kada and take it on a regular basis . Steam inhalation & seekai will also help you in case of severe attacks. Thanks for sharing your feedback and I hope the remedies help you. Yes Shraddha ji ..thats the beauty of indian cuisine …all these masalas we use on a day to day basis have so good impact on our health. Totally agree with you Mirthula , it is so difficult to keep the kids away from ice creams and cold drinks. Changing weather is another villain in the whole story. With the changing weather conditions on one side and the heartache of restraining the kids from having their favourite ice creams and milkshakes on the other……,these tips would come pretty handy I guess…. moreover ajwain and garlic are simple items that are surely part of every Indian kitchen…. So no problems in procuring them as well. Thanks for sharing these home remedies Neha……keep up the good work! its too good & useful for kids & other family members.best part of thsi these all things are easily find out inevery kichen.